Frettin’ the fretboard today. Don’t rush, don’t fret! Today’s all about patience, getting it right. The more accurate at this point, the easier the set up will be when it comes time to string the guitar. Levelling the fretboard. You can see gaps under the straight-edge ruler at the ends of the fretboard. There was a significant BOW in my fretboard. It was rather raised in the middle, that if you held a straight-edged ruler across the fretboard, you could see gaps at each end, almost 2mm wide where the fretboard dipped downwards into the soundhole. The fretboard needs to be level so that there’s no fret buzz when you string up the guitar. Apparently the cutaway guitars have significant bows in their fretboards when first made. This is because when you glue the fretboard onto the neck, the area around the cutaway doesn’t have enough structural support. But I’m told you DO NOT fret up the fretboard BEFORE gluing to the neck, because when inserting the frets, the pressure of the metal being hammered into the wood warps the wood…. and then you’ll have level problems. I thought my days of sanding gidgee were over, but no. More sanding. It’s the toughest of woods, and sanding can be pretty tedious. At least the sanding is broken up by checking the fretboard against the straight edge again. I had to be careful I didn’t sand too much of the middle out, as I was concerned I would sand through to one of the fret dots on the edge of the fretboard. The sanding block has the 12° radius to continue to maintain the curved fretboard shape. I used the small fretboard sanding block to sand out main dips and humps in the fretboard, then used the long fretboard sanding block to go over the entire fretboard and assure that it’s all level. 80 grit sand paper helps to do this as quick as possible (although it’s still a slow process….). Once I was confident the fretboard was level I had to re-cut the frets using the fret cutting saw, to make sure they were the right depth. When I was confident with the radius and level of the fretboard, I then had to sand the fretboard with varying degrees of sand paper – coarse to fine: starting at 80 grit coarse sand paper, I then went to 180, then 240, followed by a final sand using 400 grit paper. Not a lot of sanding is required for each level, but each level gets the fretboard smoother and smoother till it ends up with this gorgeous glossy smoothness that will be easy to slide fingers across when playing. Thankfully the scratches and mistakes I made on the fretboard mostly vanished during sanding. And I was about to find out the dodgy cuts I made for the fret slots would soon be covered and hidden when I inserted the frets. PHEWF! I always wondered how this was done. I remembered watching other students doing parts of, and I wasn’t looking forward to the process. I expected it to be painfully tedious when it came to setting the frets up accurately. It’s certainly a process that requires precision, repetition, and careful monitoring. But I found the challenge enjoyable and doable. First you cut a piece of fret wire from the big coil of wire – the width of the fret – say 6cm+ to be safe. The metal is a combination of nickel, silver and other metals. It’s a soft metal, and can be easily filed, dinted, bend, etc. Next you hammer the fret wire into the fret slot previously cut. The fret should stay in place on its own. As you hammer it into the fretboard, pressure is applied to the wood and the fret stayed in place. It’s got these little ridges on it to grip into the wood. But the rare case that you’ve cut the slot too wide for the fret, it may pop out – which it did on my first fret, and a couple up the end of the fretboard. In this case, I needed to superglue the fret in, and clamp it down till it held. The process of inserting the frets requires you to look at 3 consecutive frets at a time. Once you’ve hammered the first three frets in, you use a straight edge to make sure those 3 frets are level with each other. This needs to be EXACT. And not only do you need to check the level of the 3 frets in the centre of the neck, but at the edges too, perhaps imagining where the strings might cross. The 3 frets must all be touching the straight edge, at every point. If one or part of one is lower, or one is higher, you need to make adjustments. For the most part the middle of the three frets tended to be higher than the other two. The first option is to try and hammer the middle fret in deeper. If the fret still needed lowering, I would then file down the fret using a special curved fret file. I would continuously check the levels of these 3 frets until they were perfectly even. Once all three frets are level, you hammer in another piece of wire, then level the new fret with the last 2 frets. Once you’ve hammer and filed and levelled, you hammer in the next fret. One critical thing NOT do to is to go back and CHECK the levels of the frets you’ve already done. It sounds strange NOT to re-check, because precision is necessary, but it’s near impossible to line up, you would drive yourself mental trying to get everything perfect, and at the end this is not necessary. The main thing is that you start with the first fret, add consecutive frets down the fretboard, and you level them three at a time. AS LONG AS the next fret isn’t HIGHER than the previous fret you will not have fret buzz when you string it up (a guitarist’s worst nightmare). Say you insert frets 1, 2, 3 and you find that you need to lower fret 2 to make it level with 1 and 3 before adding fret 4. You file and lower fret 2. When you add fret 4 and find that fret 3 is higher than fret 2 and 4, and you file down fret 3, you DON’T GO BACK and check that 1,2 and 3 are still level. You just keep going down the fretboard, applying the rule that as long as the former fret isn’t higher than the latter fret, you will not get fretbuzz. I hammered and filed and levelled off all frets down the fretboard. From Fret 17 onwards you are required to hold something against the soundboard inside the guitar behind where you’re hammering to add support when hammering. I used the wire cutters to trim off excess fret wire on the edges. This was followed by filing the edges, so that the frets are flush with edge of the neck. 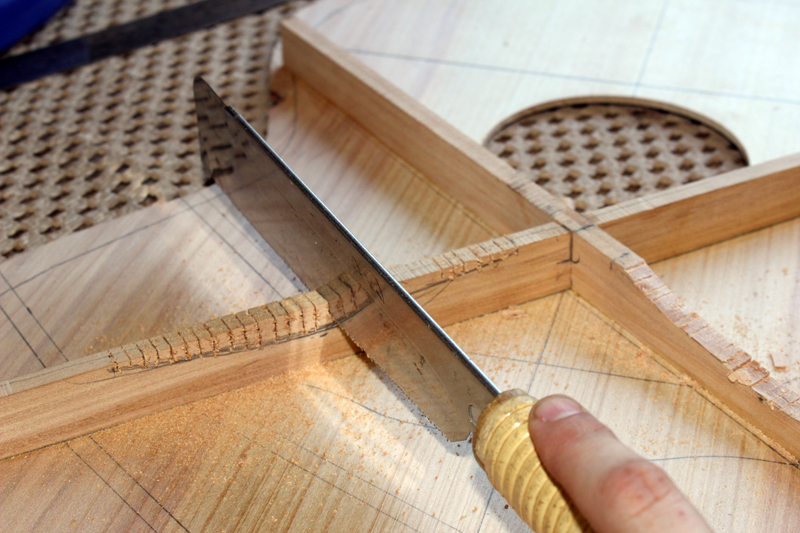 A bevel is created on the corners of the frets using the same metal file. I will need to round off the edges further more to make it safe for hands to slide across the neck, as they are still quite sharp. Looking like a guitar!!! Hopefully, when stringed, there is no fret buzz, and it’s an easy set up. https://jennybiddle.com/wp-content/uploads/2011/12/day7-3japanesesaw1.jpg 533 800 jen /wp-content/uploads/2017/08/jenny-biddle-logo-17.png jen2012-04-03 20:44:362012-11-06 10:30:32Day 22: Fretting!